Description: Ex Midsouth unit rests in the Arkansas-Oklahoma Railway yard. Title: I wonder who this unit used to be long to? 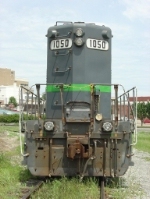 Description: AOK 1050 is worked on by the AOK mechanical department at the Wilburton facility. Description: Parked at the AOK Wilburton yard. 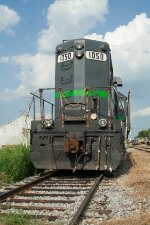 Description: AOK GP10 1050 receives mechanical attention at the AOK Wilburton yard. Description: The only EMD found on the A-OK on the Thefireman's great western excursion.